When Elise Perez meets Jamey Hyde on a desolate winter afternoon, fate implodes, and neither of their lives will ever be the same. Although they are next-door neighbors in New Haven, they come from different worlds. Elise grew up in public housing without a father and didn’t graduate from high school; Jamey is a junior at Yale, heir to a private investment bank fortune and beholden to high family expectations. Nevertheless, the attraction is instant, and what starts out as sexual obsession turns into something greater, stranger, and impossible to ignore. 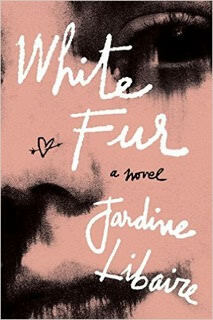 White Fur follows these indelible characters on their wild race through Newport mansions and downtown NYC nightspots, SoHo bars and WASP-establishment yacht clubs, through bedrooms and hospital rooms, as they explore, love, play, and suffer. Jardine Libaire combines the electricity of Less Than Zero with the timeless intensity of Romeo and Juliet in this searing, gorgeously written novel that perfectly captures the ferocity of young love. I’m not quite sure why I wasn’t a huge fan of the book. The writing was decent, though more of a literary prose than I often choose ( but it’s good to get out of the regular reading choices). Each chapter is essentially one month in the life of the couple and follows them over a period of just over a year. I think my main issue was that I didn’t connect at all with any of the characters so found it difficult to relate or really care about them. I didn’t think about the characters or the book after putting it down. I didn’t find that I really understood them that well, and that could be because of the style of writing. To be clear, it’s not a typical love story with happy endings and warm fuzzies. The relationship between Jamey and Elise was often difficult to read at times. I found a lot of the intimate scenes to be unnecessary and gritty. I wouldn’t consider myself conservative, but I found some of the sexual encounters to be more gratuitous for shock value than for moving the story forward or making me understand the relationship between Jamey and Elise better. From the description, I thought there would be more vivid settings of New York City and Newport in the 1980s. Other than the copious amount of popular 80s drugs mentioned like cocaine and LSD, I thought the story could take place in almost any city of the 1980s. I would have liked to see more geographical/people/historical event references to really capture the feel of the overdone 80s. Overall, it was a quick read but not a story that will stay with me. As part of the TLC Book Tour of this book, I was provided a copy of the book in exchange for my honest review. All opinions are my own.